At last week’s “Zoning Update Workshop” residents were given a first look at a vision of development of the Municipal Place Gateway and the North Riverside neighborhood presented by a consultant hired by, and working with, the Board of Trustees. Yet the members of the public present seemed to feel, in my opinion correctly, that this was not simply a back-of-the-napkin idea session, but that real plans were in the works that had the potential to change the character of the village, and not for the better. 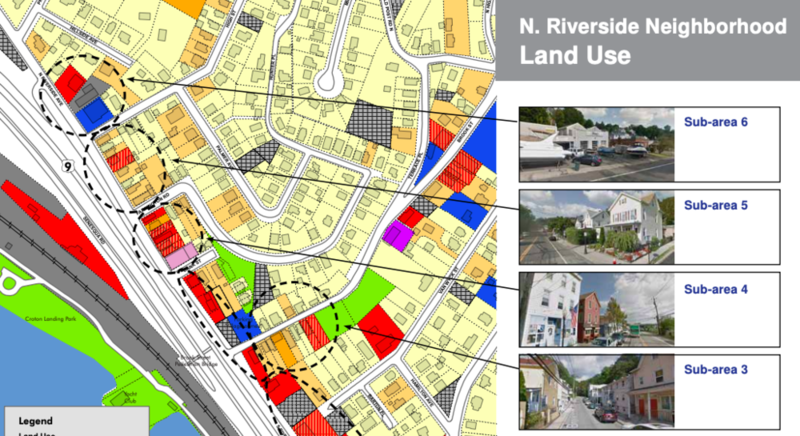 While most of the attention was being paid to the potential redevelopment of the North Riverside corridor, it's worth noting that the properties along that street are private properties, and that even if the area was rezoned as was suggested, the redevelopment of any particular parcel in the area is not necessarily inevitable. This is not the case in regard to the Katz Property, which is within the Municipal Place Gateway area. For those who do not know, the village took ownership of the wooded property across Maple Street from the CVS plaza approximately 15 years ago as part of the settlement of a lawsuit brought by the owner of the property who claimed that zoning code changes enacted at the time had devalued his property. The village paid $900,000 in settlement of the suit and took ownership of the property as part of the deal. It is also worth noting that the board has recently learned that it must complete its proposed Croton Point Avenue project this year or pay back $600,000 in grant money the village has already spent on the project. Residents were told when this project was proposed that the village’s share of the cost would be $300,000, but were recently advised by the Village Engineer that the projected cost to the village has increased to at least $1.5 million. Our DPW Superintendent warned the board that bids for this project, which is apparently going to be done no matter what the price, could come back “astronomically high.” A land sale could be what the board is counting on to offset the village’s potentially “astronomical” price tag for this project. The Katz property is a wooded oasis in between two strip malls. It gives a visual and emotional calming space that preserves the character of Croton. The rush to develop in order to fund the multi-million dollar CPA construction is unwise, and making decisions about Katz in a series of secret meetings is neither democratic nor legal. NOTE: To see the Municipal Place Gateway and North Riverside Neighborhood Zoning Study click here.